Have you ever read something, either online or in print, and forgotten to bookmark it so that you could go back and find it later? Well, that happened to me recently. Before Christmas I read a blog post somewhere about “painting” sugar cookies before they were baked, but when I went to find it again, I couldn’t. A (not so) quick Internet search revealed quite a few posts about the subject. I found one at She Wears Many Hats that I remembered reading, and also one at Pioneer Woman. Both of those, like most of the others, uses an egg yolk as the base for the paint. I thought I remembered reading about a technique using evaporated milk instead, which was what I wanted to do. I never did find one, so I decided to try it anyway and see what would happen! 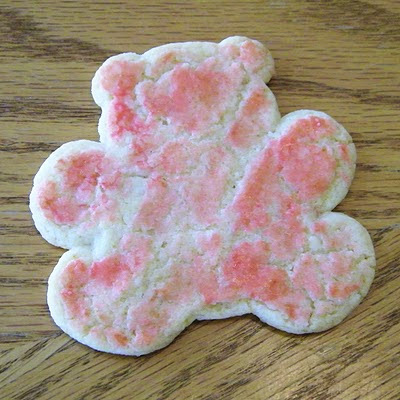 For this little experiment, I used a sugar cookie mix. I needed something fast and easy, and since I had bought some mixes when they were on sale I figured why not use one. Start by pouring a small amount (seriously, no more than a tablespoon really) of evaporated milk into a small cup or bowl. 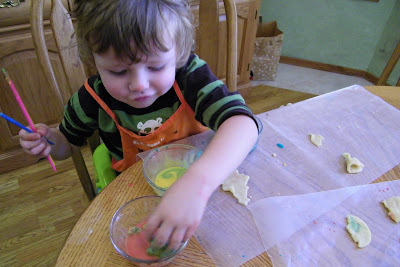 Add a few drops of food coloring, stir, and --- instant cookie paint! Repeat for each color and you’re good to go. When I went to Michael’s last week I looked for some brushes in the cake and candy section. I found a package of three for $1.69. Because I’m cheap frugal and knew that I would need at least two sets, because heaven forbid the kids share, I walked two aisles over to the kids crafting section, and found brushes that were almost identical. Six bucks for 144 brushes, plus a 40% off coupon. Perfect! They are not fancy brushes. This is not fancy work. Use what you have or can find! Just make sure they are clean, since you will be using them on food. 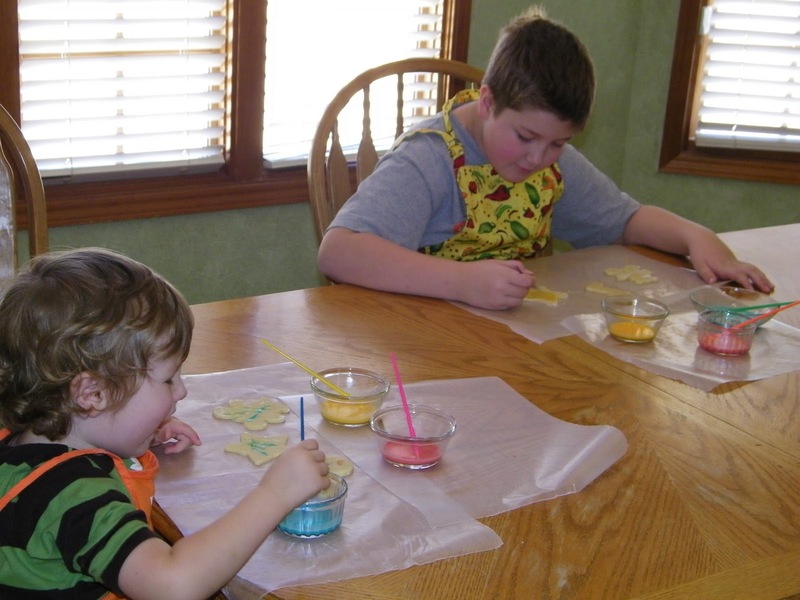 The next step is to roll out your dough and cut out your shapes. I just used a random assortment of cutters that was easily accessible. Meaning I grabbed what I could because the natives were getting restless. Anyway, set up the kids and let them go to town! Both of my kids had fun with this, and I would probably be willing to do this again. I’ll be honest, my blood pressure likely rose during this activity. But that was due mostly to the fact that I decided to try this at naptime, because we needed something to do when neither of the little kids would sleep…probably not the best idea in hindsight! See this little monkey? 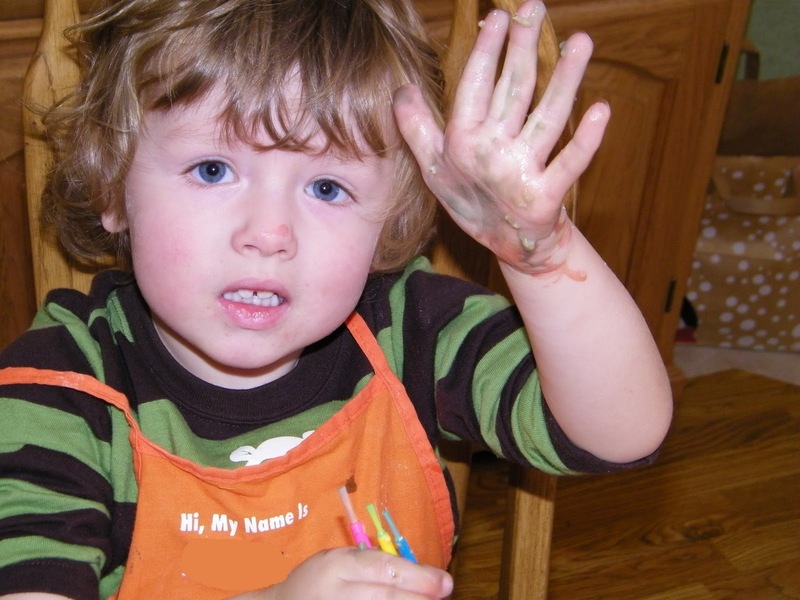 This would be the reason I didn’t want to use an egg yolk based paint! I liked the results of the cookies we did but based on the pictures I’ve seen, the ones using egg yolks do turn out with better colors. 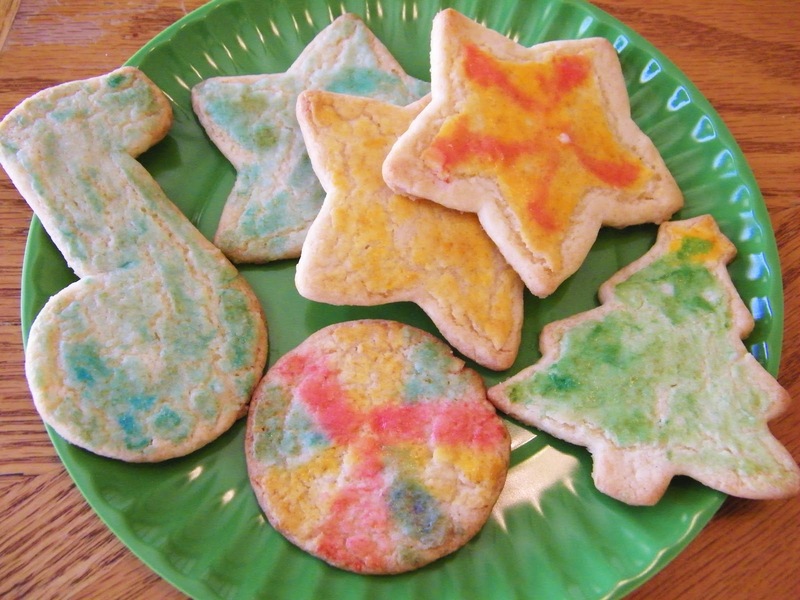 You can also add colored sugar to the cookies before baking for more sparkle. So cute! I'd never heard of painting sugar cookies, but now I'm curious for the upcoming holiday seasons.